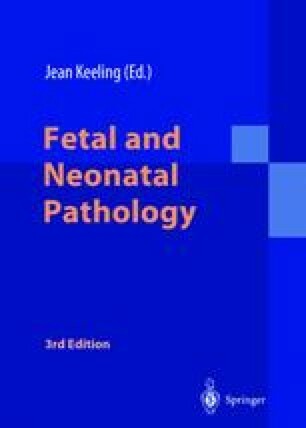 The importance to clinical practice of information obtained by adequate necropsy examination of babies dying in the perinatal and neonatal periods (Alberman 1980) is often not fully appreciated by histopathologists providing a biopsy-orientated service for adult patients. Examination of stillborn infants has been particularly neglected. This is probably related both to the unattractive nature of the material and to negative expectations concerning the likelihood of being able to make specific diagnoses.